C24 Interactive allows you to monitor and manage your home even when you're at work. You can have real-time 24/7 monitoring . Imagine if you forgot to turn a light off? No problem, what to make sure your son or daughter got into your home okay after school? That's easy with C24 Interactive, you can turn off a light or see that your child arrived home safe and sound via your web-enabled devices from anywhere in the world on your smartphone or web enabled browser.. Imagine being able to see your cleaning lady enter your home, and watch her in the kitchen anytime you want to see what's going on. You can have instant customizable alerts that are sent when you want and when something happens. C24 Interactive is a unique service that lets you manage and control your Pre-Lock home security system, lighting and temperature remotely over the internet via web-enabled devices like your computer, smartphone, or tablet. Now you are in complete control of your home's lighting, heating, and appliances not matter where you are. We can create automation rules that will send you a real-time e-alert right to your iPhone or smart phone device. In a rush and forgot to set the security system? Well that's a worry from the past, grab your iPhone or blackberry and log into our free DSC portal that you can download from the apple store and turn your mobile device into a web-enabled remote keypad. 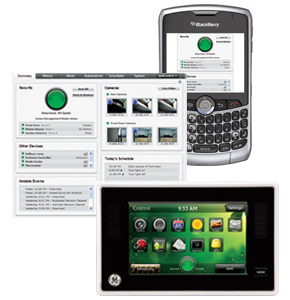 You will be able to use your blackberry or iPhone with our new C24 interactive service and arm or disarm your security system from anywhere in the world. You will see the status change right before your eyes confirming 100% your home is safe and sound. When you can't be everywhere at once, C24 Interactive helps you feel like your are sitting in front of your keypad. Want to adjust your thermostat so your home is toasty warm when your return? With just a simple tap on your web-enabled device, C24 Interactive lets you be virtually inside your home, controlling your home's appliances or thermostat and lighting. It's easy and truly a security game changer. Imagine being able to know not just when your alarm goes off, but when someone walks down the stairs and opens a drawer that should not be opened. Imagine we we put a contact on your liquor cabinet and one of your kids open's it, would it not be great to get an email letting you know that someone just opened the door to your liquor cabinet. Do you have a elderly parent that is suppose to take a pill every day at a certain time, how about knowing if your parent does not open the medicine cabinet when there are suppose to take there medication. You could call them and remind them it's time to take a pill. Imagine the ability of being able to know exactly what should happen in your home and fails to happen. Sort of like giving instructions, and finding out a few days later that someone did the opposite. All this information is sent directly to your smart phone and lets you know of the breach. Pre-Lock Security always suggests adding backup network communications to your alarm. Using our dual network technology we can configure your system to send signals alarm signals to our station using either your Bell Canada telephone line, cellular GSM backup radio, or even using your Rogers Cable, or any Cable TV provider's high speed internet communications integrating T-link communicator to offer protection from compromises to one network allowing our alarm system to keep your home and family safe by sending us the alarms on the backup technology . A True Game Changer In The Security Business! !